People will be more likely to attend events you sponsor if they know exactly how to get to them. By adding a map link to an event, you provide potential audience members with a map thumbnail and map link so they know exactly where the event venue is located and how to get there. Tip If you add map links to events, you can provide a Location Search control spud along with your main calendar. The spud lets visitors search for events that occur within a given radius of a specific location. Learn more about the spud. You can include a map link with any event for which you can provide a verifiable location. A place or landmark, such as the Lincoln Memorial. A neighborhood, such as Capitol Hill, Seattle. A company name, such as Microsoft. A partial or complete address, such as 1000 4th Ave, Seattle. You can add only one map link to an event. If you want to link to other map locations, add the URLs either to the Description or Web link fields in the Event Information form. For more information about links in the Description field, see HTML editor. If you import events that include verifiable locations, map links are not added automatically. You have to open each event and manually add the map link. For more information about importing events, see Import events. Trumba® Connect uses the Google Maps mapping service to verify addresses and points of interest, and then create map links. Important Other map services are no longer available. Map links you've applied using another service in the past will be converted automatically to Google Maps links both in your published calendar views and in add/edit event forms in the Trumba editing environment. 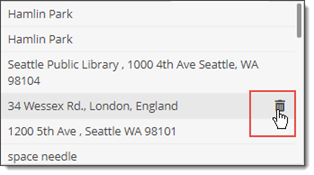 You can test map links by clicking the hyperlinked, Mapped location below the Location field in the add/edit event forms, such as in the image below. Can I remove links that I no longer use? The order of the links in the Recent Links list is determined by when each map link was added, with the most recent at the top. The list can contain up to 50 map links. Map links are associated with accounts. When you add map links to events on one calendar, those links are available on the Recent Links list for use in events on other calendars in the same account. However, if you share a calendar with another account, map links from your account are not available to shared-calendar editors in the other account. Links you add using latitude and longitude coordinates are not included in the Recent Links list. Site visitors can click the location link to display a map of the event location, or they can click the event title to open the event details page. 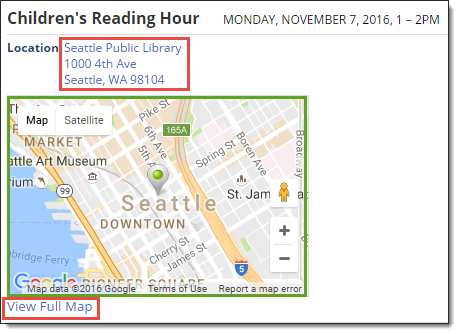 Tip Map links are also available to recipients of scheduled or one-time calendar email messages that you send. By clicking the titles of events in the email message, recipients open event detail pages similar to the one above. Create a new event on any calendar that you can edit. Or, click an event title to add a map link to an existing event. In the Add/Edit an Event form, for Location, type the place name or address where the event is taking place. Separate the elements of an address by commas or type them on different lines. You can provide a descriptive label in the first line of the location and it still maps correctly. Want to map a location using latitude and longitude coordinates? Learn more here. Tip If you're adding a map link for an address you've mapped in the past, you don't need to add the address or link again from scratch. Instead, click Recent Links, and then select the link from the list. If the mapping service finds a match, a Mapped location indicator appears, and Add Map Link changes to Update Map Link. In the Location text box, provide additional location information, and then click Add Map Link again. When the mapping service verifies the location, it's automatically added to the Recent Links list. Click OK to add the map link to the event. Plus sign for latitude values north of the equator and longitude values east of the Prime meridian. Minus sign for latitude values south of the equator and longitude values west of the Prime meridian. For example, to add a map link to Hamlin Park in Shoreline, WA, use these values for latitude and longitude respectively: +47.7470422 and -122.3087386. Tip Latitude and longitude values that omit the plus sign are assumed to be north of the equator and east of the Prime meridian. In the Add/Edit an Event form, in the Location section, click Enter Lat/Long. In the window, type or paste the latitude and longiture coordinate values, and then click OK. The coordinates appear beside Mapped location. You can test link by clicking the hyperlinked coordinates. In the Location text field, type the name of the location. Click OK to save the event. Tip Map links you add using latitude and longitude coordinates do not appear in the Recent Links list. If the location for an event changes, you may need to update the map link associated with the event. Tip Updating a map link means changing the location and link associated with an event. Updating has no effect on the Recent Links list. The original map link and the new one remain in the list until you remove the outdated one. Display the calendar that contains the event that you want to update and click the event title. In the Edit event form, in the Location field, replace the old address information with the new information, and then click Update Map Link. If the Google Maps mapping service finds more than one location, for Locations found, choose the location you want. If the Google Maps mapping service is unable to verify the location, in the Location text box, provide additional location information, and then click Add Map Link again. Click OK to add the new map link to the event. You can test map links by clicking the hyperlinked, Mapped location below the Location field. Tip Before you click OK, you might want to do one more thing. If you're not likely to ever again use the outdated link you just updated, read on to learn how to remove it from the Recent Links list. Over time, some of the map links you add to the Recent Links list may become outdated. To keep the list as compact and usable as possible, it's a good idea to remove outdated links. Tip Events that use a particular map link are not affected if you remove that map link from the Recent Links list. In the editing environment, select a calendar. Click an event title to edit an event. In the Edit Event form, in the Location section, click Recent Links. In the links list, click the red x to the left of the map link you want to remove. Click the red x to the left of a map link to remove the link. In a calendar in Apple iCal after you subscribe to a Trumba calendar. In iCalendar (.ics) or Comma Separated Values (.csv) files that you export from Trumba Connect. Tip Map links are available when you subscribe to an RSS feed of a published calendar. Clicking the event title in the RSS reader opens event details, where you can click the location or map thumbnail link to display the map.